Our home is located 10 minutes southeast from the Tucson airport. 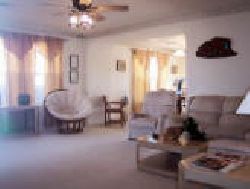 Our home is professionally furnished and decorated. It is located on the 15th hole of the Rancho Del Lago Golf Course which allows for a breath-taking view of the scenic surroundings. The sunsets and sunrises on the mountains (Mt. Lemon & Rincon Mountains) are especially beautiful. Our home is fully furnished and decorated. In the master bedroom we have a queen bed, second bedroom has a queen, and in the third bedroom there are two twin beds. There are two full baths and complete laundry facilities. We offer DSL internet, cable TV and DVD player. We also have free long distance telephone anywhere in the USA as well as a fax machine. The private pool will give you the relaxation you search for when you go on vacation. The winter months can be chilly and we recommend only using the pool if the temperature is in the 70's. We provide a full compliment of cookware and linens and a fully furnished kitchen. There is a Weber grill located on the patio near the pool. If you golf, the Rancho Del Lago course is one of the best in Tucson. I can arrange a 25% discount on green fees and cart fees as well as 35 more golf courses in the area. There is also miles of hiking trails and horse riding stables within minutes of the house. Phone, Air Conditioning, Cable TV, DVD & VCR Combo, CD Player, Full Kitchen, Microwave, Dishwasher, Refrigerator, Ice Maker, Cooking and Eating Utencils, Bed Linens, Bath Linens, Beach Towels, Washer & Dryer, Private Pool.